*FREE* Fire Safety & Awareness Training Book. Fire is not something you can ignore, the danger is immense and the costs involved are high. 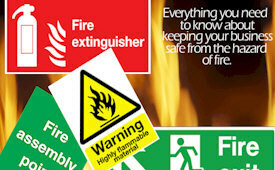 You should be fully aware of all the fire safety measures if you are responsible for the safety of others! The team here at Restaurant Doctor UK take the safety of our staff and customers very seriously. We would hate for anything bad to happen in one of our outlets which is why we remain vigilant about the threats of fire damage and danger around the workplace. Have a look below for more details. Understanding how fires start and spread. Good practices for fire prevention. What to do upon discovering a fire. Your responsibilities and the Law. All about fire-fighting equipment and how to use it. As the leading restaurant manager resource website in the UK since 2007 you can be assured that our training book contains real advice written by real professionals to help you achieve real results! Have access to expert advice 24 hours a day to guide you through the tougher times of running your restaurant and bar! Get yours today for only £2.99 FREE!